Members of our Board of Directors have been providing postharvest training for many years (sponsored by a variety of organizations and funding bodies), and starting in 2012, PEF has been offering these programs via e-learning (low cost distance education) for a wide range of young horticultural professionals in more than 25 countries. Many of those we have trained in extension of postharvest technology have gone on to use their knowledge and skills for their Master's or PhD research studies, to design extension programs for local farmers, and to develop their own postharvest handling "train the trainers" programs in their own languages. In association with local partners, we launched a new program “Small-Scale Postharvest Horticultural Technologies Short Course/ Study Tour” to be offered for up to 45 participants in Arusha, Northern Tanzania. This program was successfully completed in February 2015, with participants from Tanzania, Burundi and the USA. Program leaders (Lisa Kitinoja, Diane Barrett and Lizanne Wheeler) plus invited regional and international experts and practitioners. Invited speakers: Jacqueline Mkindi (TAHA, the Tanzania Hort Association), Bertha Mjawa (MIVARF) and Ngoni Nenguwo (AVRDC – East and South Africa Region). Participants visiting a packinghouse in Arusha, Tanzania (2015). In association with Udayana University, we launched a new program “Small-Scale Postharvest Horticultural Technologies Short Course/ Study Tour” to be offered for up to 45 participants in Bali, Indonesia. This program was successfully completed in August 2014, with participants from Indonesia, the Philippines, Malaysia and the USA. Program leaders (Lisa Kitinoja, Diane Barrett and I Made Utama) plus invited regional and international experts and practitioners. 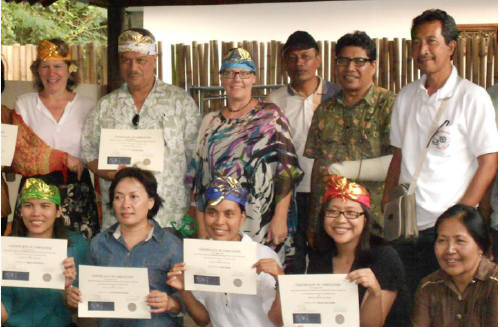 A few of our participants in Bali with their certificates of completion (2014). A site for extension agents to meet with growers and others to provide training on improved food handling, harvest, packing, cooling, storage, food safety and processing practices. A location with permanent demonstrations for observing small-scale practices, where local private companies can explain and demonstrate their goods and services related to postharvest handling. A shop with postharvest tools and supplies, packages, plastic crates and other goods that can be purchased at reasonable prices. A place where people can come to ask questions or get advice on how to use improved postharvest practices, costs/benefits and marketing options. A place where growers or traders can pay a small fee for services such as having their produce cooled and/or stored for a few days before marketing, leasing a small insulated transport vehicle, or using a solar dryer to produce dried fruit or vegetable snack products, etc. This pilot project was used as a model for future proposed projects in many regions of the world. If you would like to host a similar PTSC, feel free to contact us and ask for advice or assistance. During 2011-12 we trained 36 young professionals from 7 countries in Sub-Saharan Africa using an e-learning program developed and provided by PEF-- these postharvest specialists trained more than 13,000 Africa farmers, traders, processors and marketers during 2012-13 in a wide range of improved postharvest handling and appropriate food processing / food safety practices.